The RY253 is a low-profile, wide-base all-position radial for on-highway line-haul operations. This wide-base performer offers several advantages over dual tires assemblies: lower initial cost, greater payload potential, better fuel economy and easier maintenance. 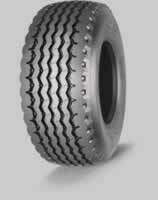 The six-rib tread design delivers top traction in wet driving conditions and excellent lateral stability. Special tread compounds generate less heat to provide reliable high-speed operation and extend the life of the tire. Heat-resistant tread compounds produce a cool-running tire. Six-rib tread design provides superior traction on wet roads, a smooth ride and even wear. Wide, rigid shoulder ribs help prevent sidewall cutting and scuffing. Special risers in the groove corners and stone-ejection blocks in the center groove reduce stone penetration for improved casing life. They also reduce irregular wear abuse caused by stone retention. Specially reinforced bead construction (highly turned-up body ply with an on-ply steel/two-ply nylon chafer construction) increases bead area durability for high-load operations and retreadability.